Although I love cheese (mozzarella, parmesan, cheddar, and others) I hate grating or shredding it. I can’t tell you the number of times I have injured my fingers, hands, and nails. I also dislike the effort I use to work on large volumes and also the inconsistency in shape which is quite noticeable if it’s going to be spread on food without cooking. So after a lot of soul-searching, I knew it was time to jump ship and join the electric cheese grater bandwagon. As we speak, is a proud owner of a powerful yet simple grater that shreds cheese very fast, delivers good results, and protects my fingers, nails, and hands from injury. However, finding a good piece wasn’t easy especially due to the many types in the market, different capabilities, and stiff competition. Why an electric cheese grater? Speed: Electric graters are way faster than their manual counterparts. They feature an electric motor that is connected to a drum or rotary blade for grating the cheese. You simply push a button and then slice the cheese. Unlike human effort, which declines over time due to getting tired, electric power remains consistent throughout. This means that you can use the unit continuously. Even flakes: one of the shortcoming s of non-electric graters is that the flakes won’t be of similar shape. Some will be large other small, some wide other narrow. This is normally because of inconsistent pressure. Electric graters deliver same sized cheese flakes which improve the appearance of the food. In case they are used in cooking, the flakes will melt almost at the same rate and this means better results. Safety: Earlier, I told you the countless times I’ve accidentally grated the skin from my hands and fingers and nicked the nails. This was among the key reasons I made the switch. With electric graters, chances of injury are minimal. This is because your fingers and hands are a distance away from the blades. Some come with a protective casing that prevents you from accidentally touching the sharp blade. Versatility: The electric grating machines are very flexible and will not only grate different kinds of cheese but also allow you to choose different designs (spirals, julienne, strips, flakes and more). Additionally, the unit also grinds nuts, almonds, pasta, chocolate, fruits, veggies and more. Some come in form of a food processor and will not just grate but also slice, shred, and chop. Attachments: I noticed that top electric cheese graters come with many attachments, unlike manual types that are very basic. Many attachments mean you can slice different cheese types like mozzarella, cheddar, and parmesan and you can choose a different style to suit the food or personal preference. What’s more, changing the cones is very easy and straightforward. 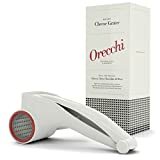 Grating soft cheese like Cheddar, Pecorino, or hard cheese such as parmesan is a breeze with this rotary cheese grater. 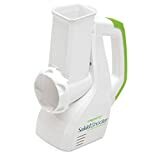 The electrically powered unit is made from ABS-free and BPA-free plastic for safety and comes in a simple and ergonomic styling for easy handling. The drums are made of stainless steel and feature ultra-sharp razors also made of stainless steel. The professionally made unit delivers good results and isn’t too noisy. It works perfectly well and is also very simple to operate. Other than cheese, the grater also works on almonds, chocolate, dried coconut, nuts, and pistachio among other things. For convenient storage and carrying, the item comes with a carry bag. This cheese and vegetable grater is very basic and easy to use. It comprises a stainless steel drum comprises sharp rotary blades for quick grating of cheese. The green colored unit is well made for daily use and has strong suction cups on its base to prevent movement during use. It grates in different styles courtesy of the 3 interchangeable drum blades and is easy to clean thanks to the easy disassembly. Assembling the accessory is equally simple. The multipurpose item is also suitable for vegetables, pasta, and fruits. It has a safe design to prevent injury and remain firm on the spot to prevent spillage or accidents. If you don’t like manually grating cheese, then this electric grater will suit you. It has a practical design and size for easy handling as well as safe operation. The unit has a strong motor and powerful grating head that will work different kinds of cheese. It is energy efficient and doesn’t produce too much noise. The versatile piece is very portable thanks to the good weight and carrying it isn’t a problem. It’s very easy to clean and is resistant rust, stains, and corrosion. You will agree with me that it does look quite elegant and will look good in any kitchen. Did I tell you it’s very strong and durable? If you are tired of slow and manually emending cheese graters than this unit by Presto is just what you need. It is very practical and can be used even by newbies. The well-made unit can handle large volumes of cheese without problems and is also suitable for nuts, fruits, vegetables and other things. It works very smoothly, produces minimal noise and is also energy efficient. The good design allows the final product to enter the bowl without spilling while the firm base limits unnecessary movement. Cleaning the unit is easy since it can be dismantled effortless and putting it back together is easy. It comes with interchangeable cones and is also portable. The Hamilton Beach (70670) is not only a food processor but also a good cheese grater. The heavy-duty unit is perfect for home and commercial use and has a 10-cup capacity. 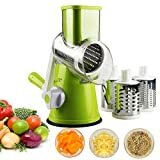 It’s powered by a robust 525-watt motor which together with the stainless steel chopping blade will quickly grate cheese, fruits, bunts, veggies and other things. The housing is made from BPA-free material to keep the grated products and user safe. It is powered from the mains electricity and comes with 2-speed options for better functioning. The unit can slice forward and in reverse as well. It is dishwasher safe, easy to clean, and has a convenient cord storage. I’ve always respected the Cuisinart brand when it comes to kitchenware and related accessories. The DLC-2A is a known product of the company and is perfect for the home, restaurant, catering unit and other places. 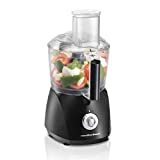 These food processors are suitable for slicing many food items including cheese, fruits, veggies, and nuts. It has a powerful 250-watt electric motor which together with the stainless steel blade shred in uniform sizes. The blade can easily be reversed while the 3-cup capacity plastic bowl provides a nice place for holding the shredded product. I like the white color which gives it a hygienic and clean appeal. Operating the accessory is simple due to the simple push button and it comes with a spatula. The 02910 Sled Shooter makes grating cheese look too simple. This is because of the fast grating that is provided by the powerful electric motor and strong stabiles steel blade. The unit is well suited for small and large volumes and has a good capacity bowl to handle the end product. It features a solid base that provides stability and ensures the grater doesn’t move unnecessarily. The accessory can also slice nuts, chocolate, cracker crumbs, veggies and more. Since it disassembles easily, cleaning the item is easy. And once dry, you can put it together with minimal difficulties. Other than the good grating/slicing and easy cleanup, consumers love this unit for the nice design and reliability. Yes, an electric grater is designed to make the work of grating cheese and other things easy. You won’t need to use too much manual force to carry out the activity. However, if you press it too hard or introduce too much cheese, then the built-in motor will be overworked. This may lead to overheating and eventually burning out or getting damaged. If you have a basic grater that is designed for small quantities then you shouldn’t use it for a long period to grind large amounts of cheese. Doing so not only affects the grinding parts but also shortens its lifespan. The motor will be overworking and possible overheating regularly, the shaving head will become blunt sooner than later and excessive friction will damage some moving parts. If you plan to grate large cheese volume, go for a heavy-duty type. The accessory will become clogged with cheese and if left there, the parts may attract bacteria and germs. As you can see from this video (https://goldenagecheese.com/blog/cheese-graters/benefits-of-using-automatic-cheese-graters/ ), cleaning a manual grater is much easier. This is because of the simple design, fewer moving parts, and no electricity and electrical parts. Cleaning an electric type entails using a clean cloth to wipe it, removing any stuck pieces, and not using too much water as it may interfere with electrical parts. The cheese grater needs to be stored properly after use. You shouldn’t leave it out in the open as this exposes it to dust and dirt, you also have to place it in a cool and dry place, and you should place it in a case to protect it from bangs, moisture, dirt, or impact. If you are using the heavy-duty type that doubles as a food processor, you should consider covering it. Grating cheese should require too much effort or time. You don’t need to risk injuring your finger or hands because of using a manual grater. You also should get uneven flakes that may ruin the appearance of the meal. With the right cheese grater, you will use minimal effort to get quality and evenly shaped cheese flakes. You’ll also require less time to produce it and can handle large volume with ease. As you can see, I managed to pick the top electric cheese graters on the market. To do this, I focused on reliability, efficiency, safety, hygiene, durability, and cost. You can be certain that grating cheese will be much easier and the results impressive. Pick the best for maximum satisfaction.